Home / The Archives / Cateye Velo 5-Good Price! 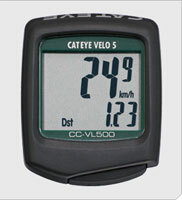 The Cateye Velo 5 at Modern Bike has a real good price of $15.99. You might want to get one of these bad boys to help keep track of you mileage while riding to work. The Velo 5 is CatEye’s entry-level computer. It features a new, larger screen and a large button for easy operation. Like all CatEye’s computers, it is ultrasonically welded and highly water resistant. The universal bracket and sensor mounts allow the Velo 5 to mount nearly any handle bar and fork.